When we got one inquiry from our customers, we are always ask “what tolerance the parts you will need, or whether you have any special requirements for the tolerance.” Yeah, in the world of CNC machining, people are always often looking for what they call precision CNC machining parts. But what exactly does that mean? —Dimensions, composition and CNC machining part’s performance. We always have to discuss with our customers on these before quotation, as this will affect our unit cost. Creatingway will shares more these CNC machining knowledge to our global customers. Today, we will mainly introduce above three characteristics. In fact, whatever this will be precision parts, or standard parts. 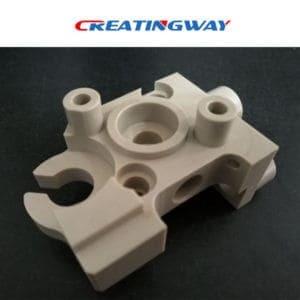 At Creatingway, we will do same cnc machining process. make each of stages strictly quality control and production inspection to make sure our product high precision and high standard. For many customers, the dimensions are the primary standard when it comes to precision CNC machining parts. In fact at CNC machining processing, we are always keep very tight machining tolerance with advance equipment and technology to meet the requirements of the customers. Of course, we also can get a high level of dimensional precision that maybe it is greater than what a customer needs. Of course, precise dimensions and cost are closely correlated. When you need to get one high precision cnc machining parts, this costs will be higher. “Why this price is so higher” that’s not just because the precise dimensions usually require machinery that itself has the tightest tolerances. Moreover, professional technical personal and the best operator also are indispensable to machining precision CNC machining parts. Therefore, the total cost of machinery and labor is higher. Many of buyer or consumers need to order and assemble different productions as their requirements. But many of them only know the functions and applications of the products, not know the engineering material is crucial to the composition of the products. In fact, there are a log of engineered metals and alloys whose composition makes them “precise”. So when one inquiry is coming, we are always ask our customers for the material, quantity and tolerance of the parts before quotation, they’re indispensable to us. At the same time, we also ask our customers some other questions of the parts. Such as: what function and application of the part. So we will provide the best proposals and machining processing to our customer for choosing and comparing. For instance, one famous example is V0 ABS material. In general, when we learn from our customer that this part will be used in Electronic industry. Firstly, we need to think about is that the materials must be protected from electricity and flame resistance. And for now, V0 ABS material is used widely in the Electronic device industry. Performance and application may be closely related to the composition of CNC machining parts. The application of one part is often depend on the material itself properties. For example, Magnesium, which along with iron, zinc and manganese are widely used in medical devices due to its bio-absorbable properties. Basing on different performance and application of the parts, we are always get you the best suggestion to meet our customer’s requirements on the material choice. The right using of the material, not only can help you saving the production costs, increasing the service life of the parts, also can give us more security in our daily life.